Babylonian clay tablet BC 7289 (c. 1800–1600 BC) with annotations. 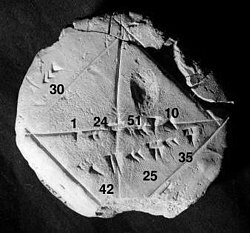 The approximation of the square root of 2 is four sexagesimal figures, which is about six decimal figures. 1 + 24/60 + 51/602 + 10/603 = 1.41421296... Image by Bill Casselman. Numerical analysis, algorithms ke parrhai hae, jisme numerical approximation (symbolic manipulations ke jagha) ke kaam me laae ke mathematical analysis ke problem ke solve kara jaawe hae. Gilat, Amos (2004). MATLAB: An Introduction with Applications (2nd edition ed.). John Wiley & Sons. ISBN 0-471-69420-7. Ii panna ke 14 January 2014, ke 10:25 baje, pichhla time badla gais rahaa.